Central Lake Joseph on the eastern side providing full day sun and Muskoka sunsets. Boat access only. 1000' frontage. Extreme privacy but close to all the Muskoka popular hangouts! 5 minutes to Oviinbyrd Golf. Also 10 minute boat ride to Lake Joseph's Clublink Golf Club and 15 minute boat ride to Rocky Crest. 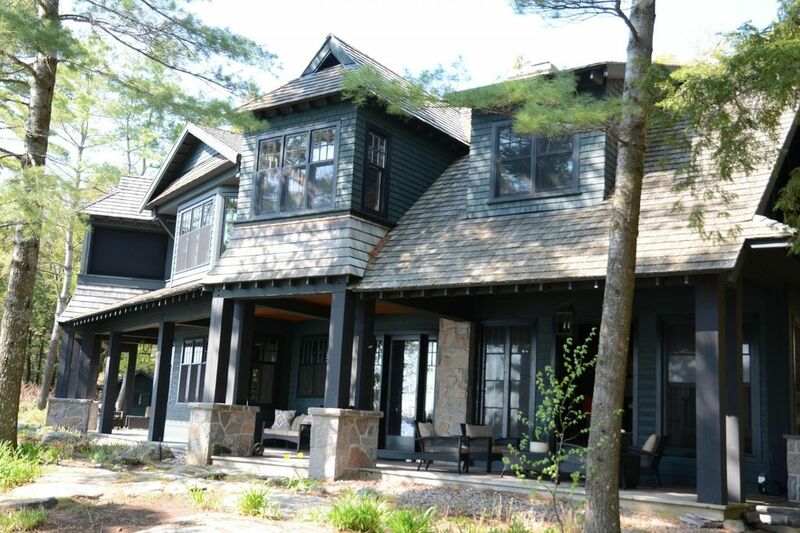 Harwood rests comfortably surrounded by flagstone walkways, a swimming pavilion, and an outdoor sitting area that provides exposure to Muskoka sunrise, and sunsets. The property is steps-free and very centrally located. Two boathouses, separate swim dock with gazebo, fire pit, BBQ, private shallow sandy beach cove and two outdoor showers. The lower level brings all the comfort and convenience of home, with top end appliances, full side-by-side SubZero fridge/freezer, separate walk in refrigerator, under-counter drawer freezers and large pantry for easy storage and access. A double sided fireplace, 2 separate sitting areas (1 with TV) and fully functioning bar area with ice-maker are complimented by a main floor powder room. There is twelve person seating in a truly traditional Muskoka dining room. Also on the main floor, a mudroom, office space, laundry room with double washer/dryer. You may also take advantage of the onsite gym with barn doors that open facing the Lake. UPPER FLOOR - A cozy nook, Queen bedroom, boy's room with two double, and two twin beds, girls room with a Queen bed and window seat twin, and second ensuite washroom. Also a large 2nd floor washroom with separate tub, shower, and large sink. Master has an en-suite with soaker tub, glass walk-in shower and walkout private balcony. BOATHOUSE - Includes a bunk bedroom, Queen bedroom, bathroom including shower and bathtub. Kitchen contains a large farm sink, hotplate, full fridge, microwave and four bar stools for comfortable seating fill and dining table with 4 chairs. Outside on the deck, Muskoka chairs provide seating.